While long lines of people queuing up outside Reliance Digital outlets for preview SIM cards may be good news for Jio, it has also meant long delays in activation of these cards. At least some Reliance Digital outlets are unable to cope with the huge demand and are struggling to process and scan the documents submitted by those buying SIMs are the preview offer. With just two employees, the store has no option but to divert all manpower to simply selling the connections. While earlier, they would activate all connections on the same day, now unprocessed CAFs or customer acquisition forms are piling up. “It could take days to clear the backlog,” says the employee when we ask them when the connection will be activated. The delays are being felt mostly by those who are buying a second SIM for use in their existing 4G handset. These SIMs can only be bought from Reliance Digital and RD Express stores, which is what is causing the huge pile-up. However, you can also get Jio SIMs with preview offers when you buy new handsets, especially LYF-branded ones. And these handsets can be bought from most smartphone retailers. These retailers also have their own stock of Jio SIMs to be given free with new handsets. The customer acquisition forms for these handsets are not routed through Reliance Digital, but is given directly to Jio. These forms — which are submitted are third-party retailers — are processed quicker. According to our inquiries, connections bundled with new handsets from independent retailers is being processed on the same day or the next day. This would indicate that activation at Jio’s end is happening smoothly, while some amount of bottlenecks are present at Reliance Digital outlets. With competitors piling on pressure on Jio to reveal its 4G tariff, the company is racing against time to bring as many high-end users onboard its network as possible. Jio now offers free SIMs on practically every 4G phone out there in the market. However, some Reliance Digital outlets are providing 4G SIMs only if the handset you are carrying in is included in the official list of ‘preview offer’ devices issued by Jio. The company currently offers preview offers for handsets from Samsung, LG, Micromax, Panasonic, TCL, Yu, Karbonn, Gionee, Alcatel, XOLO and Asus. More brands are added based on the capability of Reliance Digital outlets to cope with the incoming customer traffic. The company, meanwhile, seems to be pleasantly surprised at the enthusiastic customer response that its offer has generated. 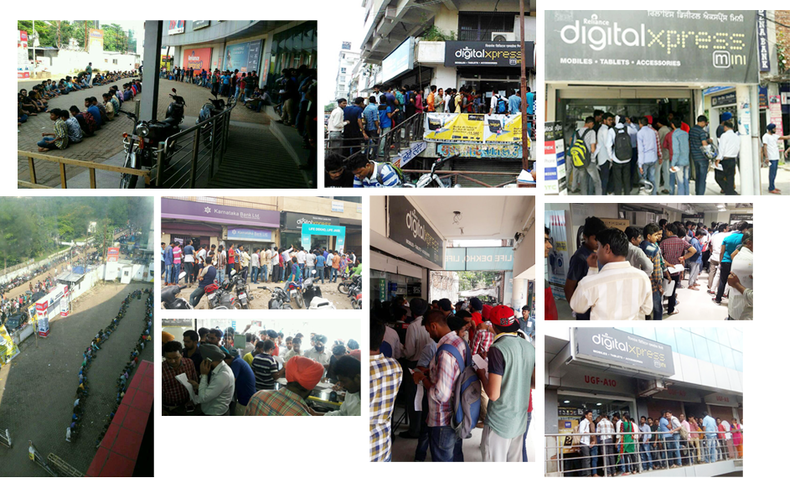 RIL’s official facebook handle has retweeted photos of long queues outside the Reliance Digital outlets. In fact, the primary reason for restricting SIM sales to only a few brands was to prevent total chaos at Digital outlets. While the company has largely succeeded in ensuring a smooth roll-out, the real test of its strategy will come this week. The long queues outside the outlets should also be making Jio’s rivals jittery, as it is their customers who are lining up outside these stores desperately for free data and voice calls. Adjusted for purchasing power parity, India has one of the most expensive data tariffs in the world, and the entry of players like Jio is expected to make wireless Internet affordable for everyone.